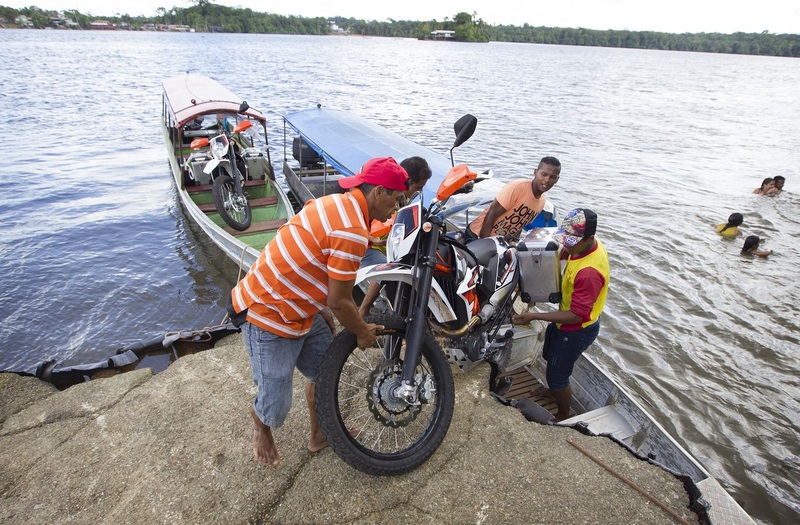 After a year of preparing and two weeks of struggling with Surinam customs the time has come: we are going to unpack and reassemble our shipped KTM 690 ENDURO Rs! The second part of the South America journey of “The Riding Reporters” is on! Three years ago I, my name is Irene Wouters, crossed the west in seven months with Daniëlle Boelens. This time I am going to finish the continental trip with Lia Bexkens for the first three months and Carli Kooper for the last two. 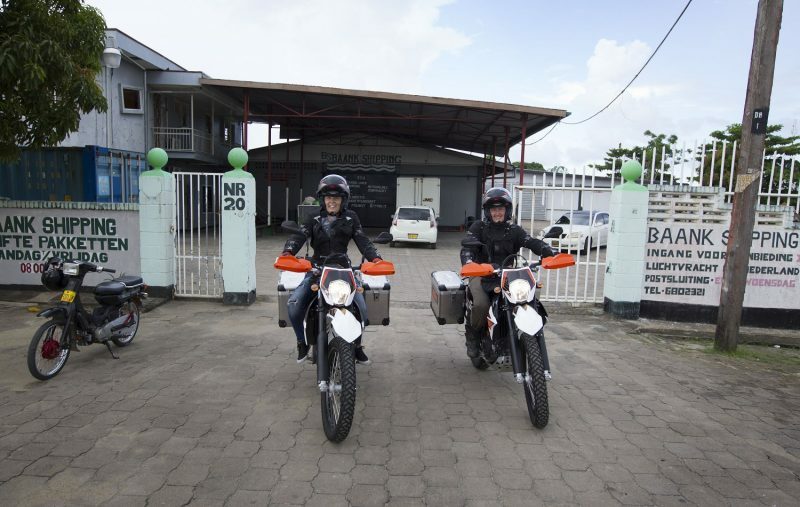 We will start riding from Surinam and spend five months heading through French Guyana, Brazil, Uruguay, Argentina and Chile and complete 25,000 km. During our journey we will visit special projects and write some compelling reports of our experiences. Besides giving these initiatives media attention we can also help them financially by donating money from our projects of “The Riding Reporters Foundation”. 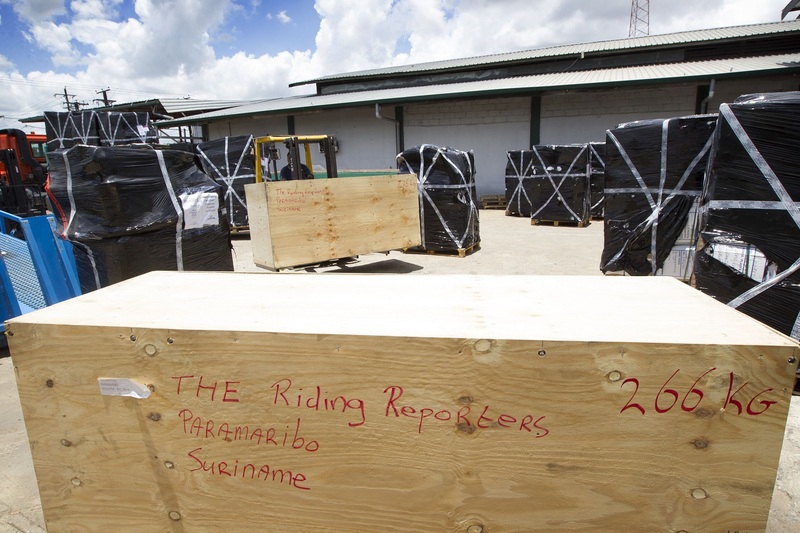 We are looking at our crates: “The Riding Reporters” unmistakably written with red marker on the wooden exterior. In steady streams, sweat drips from our faces as we demolish the wood from the steel frames in the merciless, burning sun. After two weeks, 36 mails, 32 phone calls, 14 taxi trips and even a visit to the embassy, we finally manage to get our KTMs cleared from Surinam customs. A port worker sees us toiling in the heat and moves our crates with his forklift to the sole slither of shadow. 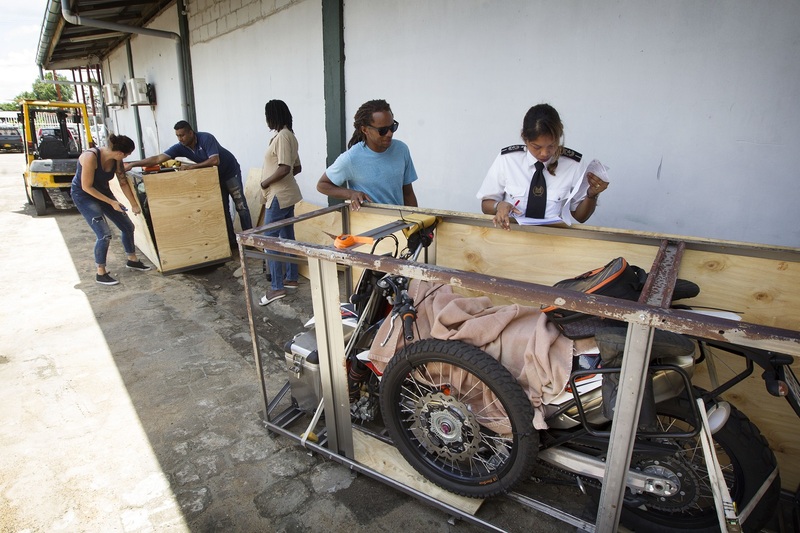 With a steady pace and a little help we put the bikes together in one and a half hours. What a relief and pleasure it is to finally have our lightweight power machines! After two weeks of delay, we feel a slight urge to get back on track. We decide to leave tomorrow and cross borders to French Guyana the same day. Packed and ready to go we get on our KTMs. At a steady pace we leave Paramaribo. The capital has only one main road and is therefore a daily source of long traffic jams. There are hardly any roads on the map. In the second smallest country in South America only one main route runs along the coast with some dead end sideways. They can’t continue inland because Surinam is largely jungle territory with countless rivers. The backwoods can only be reached by boat or plane. 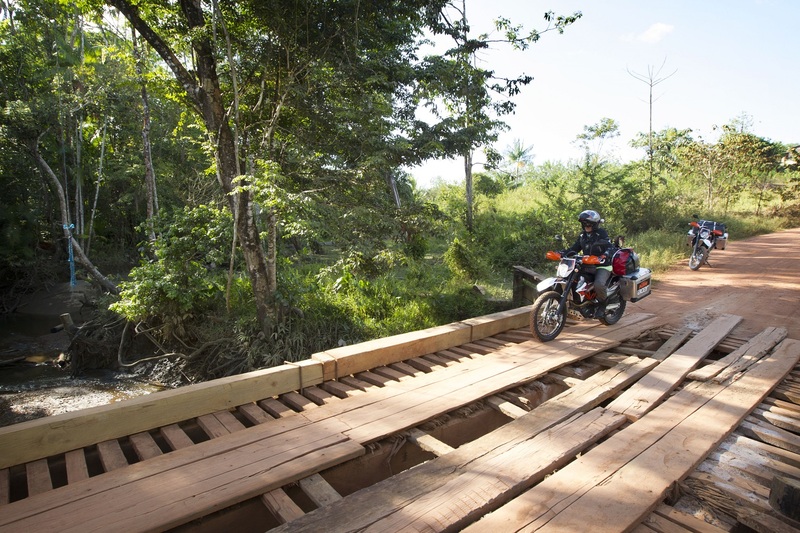 After we squirm through the hustle and bustle of the city, a mixture of relief, freedom and joy comes over us as we drive through the lush green of Surinam. Surinam not only looks exotic, it also smells that way. For the first time I enjoy the waving palms and the wind and a welcome cool breeze while riding. The time is now: we are on our motorcycles and on our way! The asphalt is flat and straight. A road you’d normally describe as boring, but that doesn’t even matter at this moment. 150 km later we arrive at the border post in Albina. After a thorough inspection of our suitcases, the barrier rises and we enter the second country to search for a meal and a place to sleep. Easier said than done. We are shocked to learn it is impossible to find a place to rest for less than 90 euros. French Guyana proves very pricey. The next morning we continue to the city of Cayenne via Center Spatial Guyanais (CSG). The CSG is the launch center of Ariane missiles of the European Space Agency (ESA). 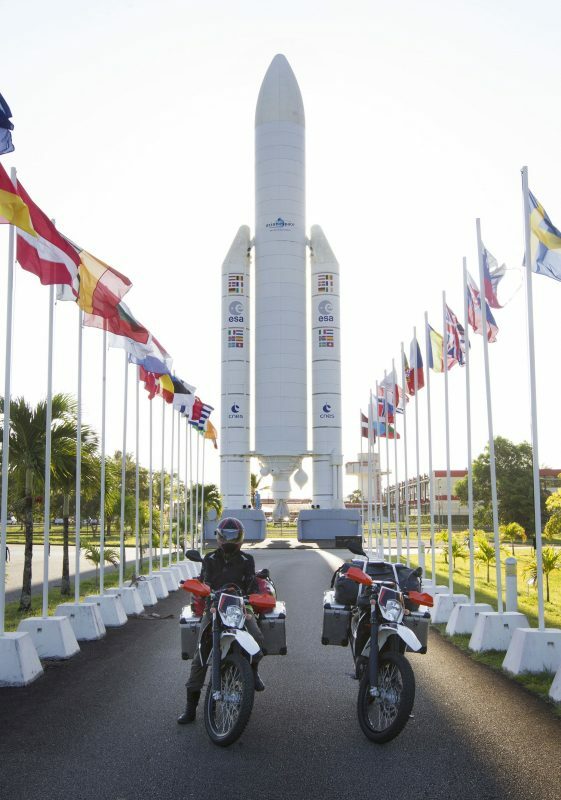 Unfortunately, there is no launch today but I do photograph Lia on her KTM next to a full size missile model. It’s only 170 km to the border with Brazil. Holding our breath, Lia and I watch how four men lift our motorcycles one-by-one into two boats. It’s nerve racking, but so far so good. Ten minutes later we are on the other side: Brazil. Nowhere is asphalt to be seen. Instead we are treated to hardened, worn tracks, steep ascents and red sand. The first bridge we cross in the sand is on the verge of collapsing. This promises to become a wonderful adventure! Belém looks like a metropolis with a skyscraper skyline. 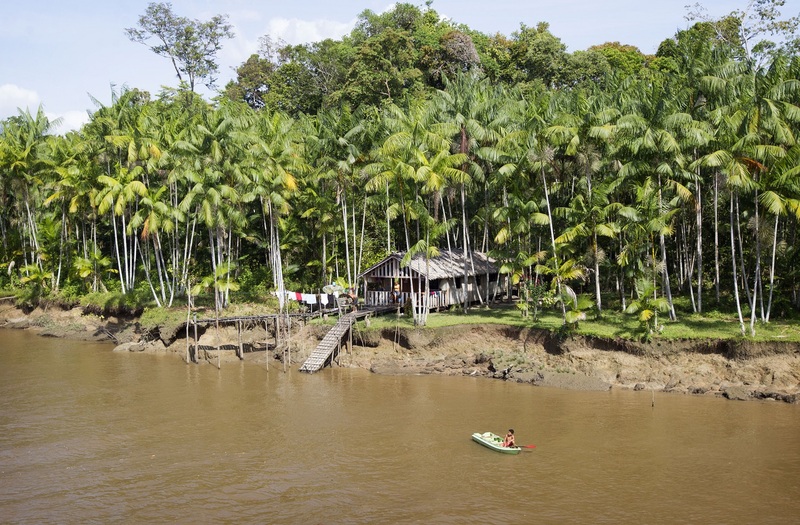 An incredible contrast with the wooden huts in the Amazon forest that we watched from the boat. Numerous roads fill our map: a complete contrast to the previous two countries. This is logical as a nation like the Netherlands fits 240 times into Brazil, which has an area of 8.5 million square meters and counts 290 million inhabitants! It does make it a lot harder to determine our route. We listen to tips from fellow travelers and residents and decide to head for colonial city Sao Luís, ride to Parque Nacional dos Lencóis Maranhenses to admire the sand dunes with lagoons and from there on go to motor vehicle-free hippie enclave Jericoacoara or Jeri. “You can park your motorcycles here and hire a jeep to go to Jeri.” Astonished I look at the boy. Is he joking? 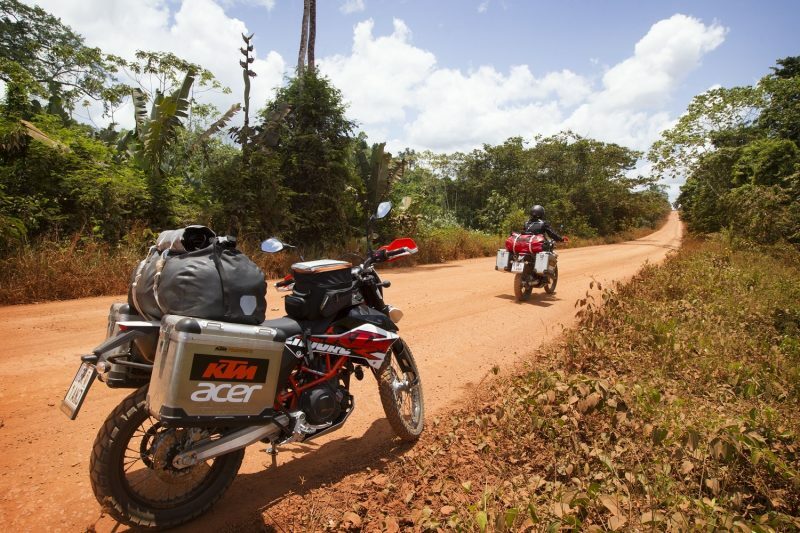 Why wouldn’t we be able to ride the last part to Jeri on our KTMs? 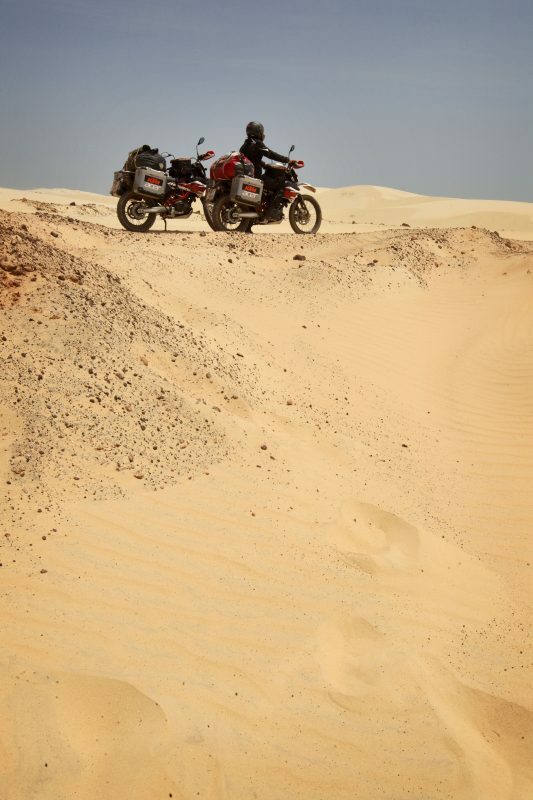 That question is answered immediately: the sand is too deep for our bikes and there’s no road. Only local guides know the route and without a guide we will get lost. Not even for a moment do I consider leaving our bikes behind. However, he keeps insisting that we will get lost and that we at least need a guide. He has convinced Lia, so I give in as well and we hire him. We deflate our tires at the gas station to get ready for the heavy sand. It is an anxious and long trip. For Lia it is too difficult and she has changed places with our guide. She is on the back of another motorcycle while the other rider only just manages to keep her bike upright. Which is more than me. It’s more a case of falling off than falling down. Back on my bike I keep flopping through the sand. But what’s that I hear and see next to me? We are riding in the pitch dark next to the surf of the Atlantic Ocean! I feel a moment of joy and triumph. I dare to enjoy it even for a little, despite the fact that it’s still exciting to ride more on intuition than on sight. How awesome with the noise of the surf in your ears and splashing drops of water on your face! At last, the end seems to be in sight: Jeri. Utterly broken but satisfied I crawl off my KTM. After a couple of days it’s time to leave Jeri behind us and get back on our orange sand masters to see what more adventures Brazil has in store for us! There is only one hope for a two-year-old girl who has been abandoned by her parents and a whole village and who has been tortured with burns in a ‘ritual’ to expel the ‘evil spirits’ in her: ‘Mama Joyce’. 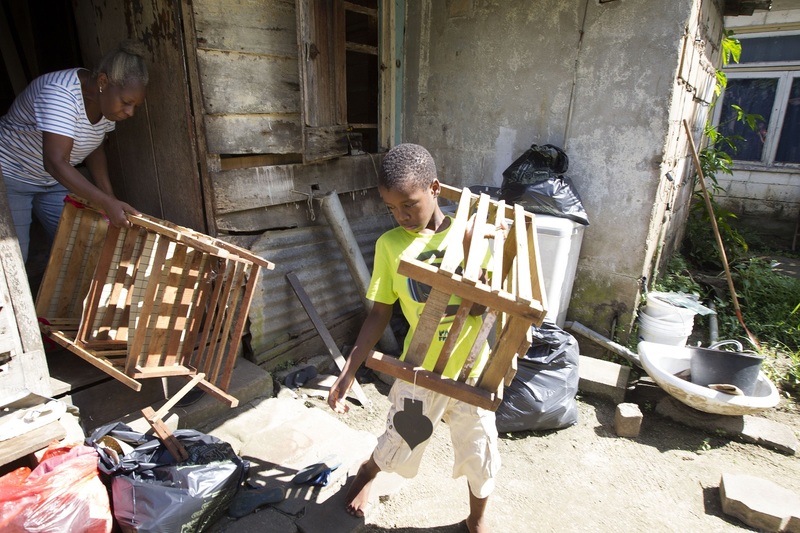 In Paramaribo she is a saviour, and takes in children with no place to go. She is a 60 year old woman who has been taking care of others her entire life. 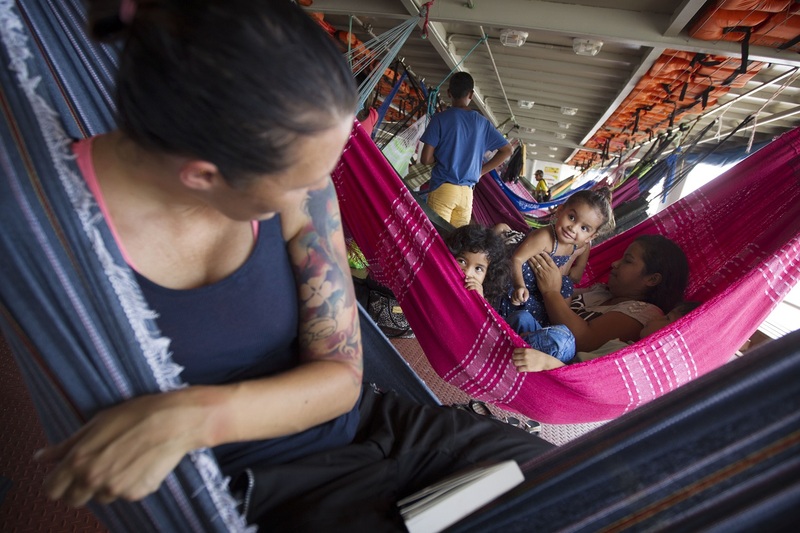 From her childhood she wished to become a mother but her life turned out differently. In 2011, after years of working she decides, besides her day to day job, to open her house for children who have no other hope. In the busiest time she had 16 living with her. Some for a few months but others for years. Youth care comes knocking on her door with the most difficult cases. Mama Joyce refuses no one. 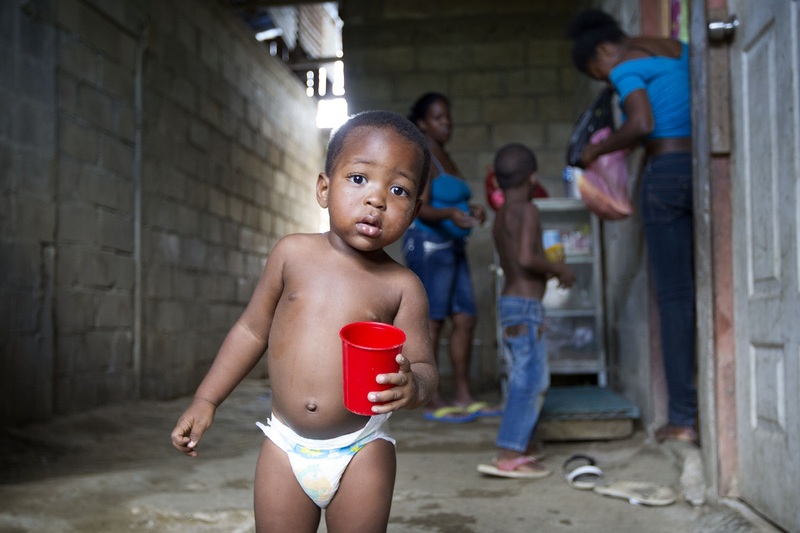 Even though she does not receive a small contribution for childcare and despite the fact that Mama Joyce provides them with shelter, a safe place to stay and food in their bellies. 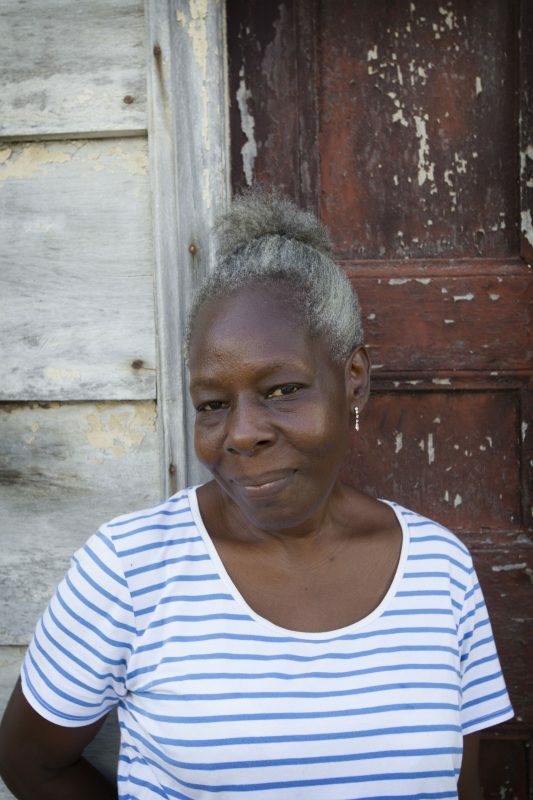 For six years she rented two houses that literally fell apart from misery. The wooden floors were full of holes and the intense heat could hardly be averted. But it offered the children a roof over their heads. They were safe, dry and fed.